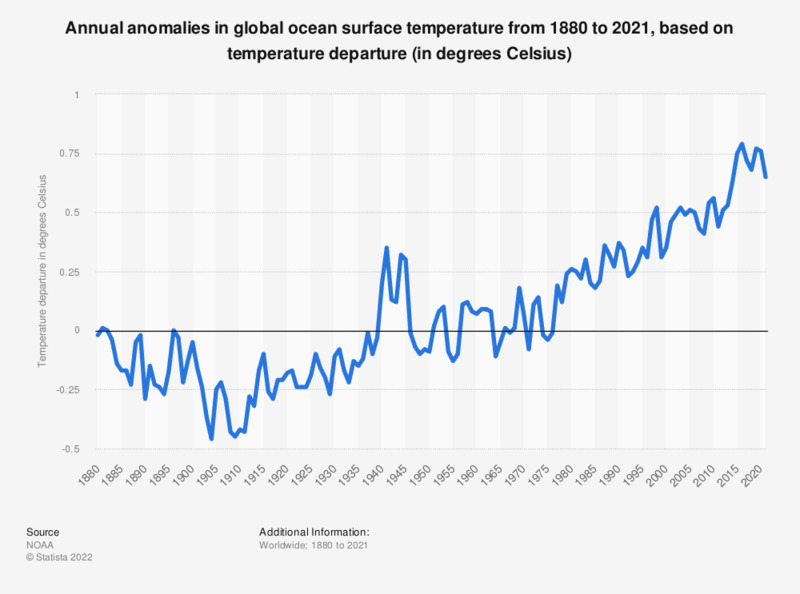 This statistic represents annual anomalies in global ocean surface temperature from 1880 to 2018, based on temperature departure from the 20th century average. In 2018, ocean surface temperatures were around 0.66 degrees Celsius warmer than the 20th century average. Oceans are responsible for absorbing over 90 percent of the Earth's excess heat from global warming. * Global and hemispheric anomalies are with respect to the 20th century average. Coordinate anomalies are with respect to the 1981 to 2010 average. All other regional anomalies are with respect to the 1910 to 2000 average. Timescale of "Year-to-Date" was used.